Update: As of 04/25/18 the Bing News content pack is deprecated because the Bing API is not longer available . This means that the content pack won’t update the model with new data. This week we’re excited to release a content pack that’s a little different than what we’ve added so far. 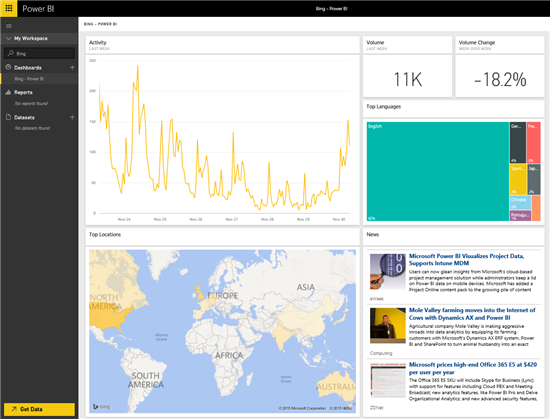 The Bing content pack allows you to view analytics around Internet search activity for a term of your choice. 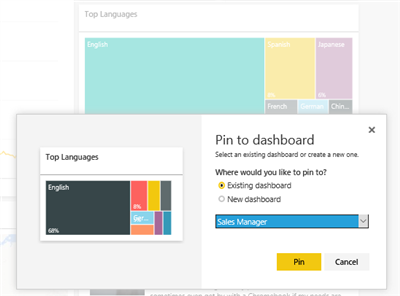 Connecting will create a Power BI dashboard with tiles that are generated directly from Bing and updated automatically. To get started, enter a search term you’d like to track. This can be any term that may be entered into Bing, such as “Microsoft” or “Power BI”. Once loaded, you’ll see a new dashboard with 6 tiles related to your search term. You can see the activity and volume of searches for the last week, including a week over week calculation. The top locations and languages of those searches are also included, giving you further insight into who is searching. Finally the News tile provides some recent headlines related to your search term, with the ability to select and navigate to any of those stories. These tiles are a little different than some of the existing tiles as they are being updated dynamically and not backed by a Power BI dataset. Hovering over the tiles shows you can still resize, edit or pin the tiles to another dashboard. Below you can see a sample sales dashboard for our fictional company. After creating a new dashboard using the company name as a search term, tiles from the Bing dashboard can be added to an existing dashboard with tiles from other data sources. Here we’ve added both our site traffic and our Bing search traffic to the dashboard side-by-side allowing further insights into our data. 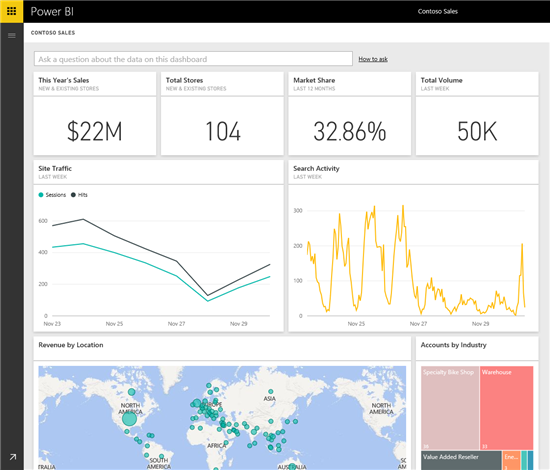 The Bing content pack for Power BI helps you track additional details on the terms that are important to you. For more details on how to get started, please see our help page.